The Retirement Advisor Council ("we" or “The Council”) respects the privacy of users of our Website RetirementAdvisor.US. Identifying Information will be available to other users of RetirementAdvisor.US to the extent you choose to post the information onto a public forum on the Website. We may collect and use information about you and your use of RetirementAdvisor.US, including Identifying Information, for our own internal purposes such as, for example, analyzing usage of RetirementAdvisor.US in order to improve them or to process membership applications. RetirementAdvisor.US logs IP addresses for systems administration, diagnostic, and site tracking purposes, and to report aggregate information to the Executive Board of the Council and Council Committees. 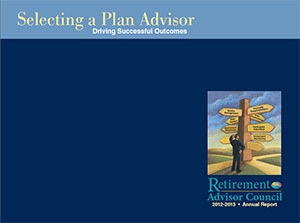 RetirementAdvisor.US does not link IP addresses to information identifying users individually. We may use or distribute information about you and your use of RetirementAdvisor.US in ways that do not identify you individually or reveal your identity. The Council may use other companies and persons to perform certain functions for us. These functions might include, for example, processing credit card payments, providing customer service, conducting surveys, and sending e-mail. These other companies and persons may have access to customer information (such as Identifying Information) that's needed to perform their functions, but they are not authorized to use it for any other purposes. After providing username and password, the resulting page will display the most current personal information that the user has given us. The user may modify this information by overwriting the text boxes with new data, or may specify via a checkbox that the account is to be deleted entirely. By clicking the "Click to record changes (or delete)" button on that page, this new information will be stored as the user's resume (or will be deleted, if the appropriate checkbox was checked).